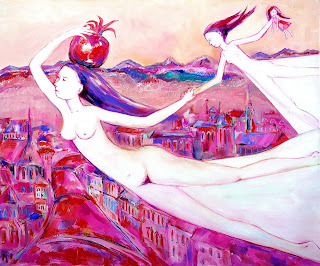 Mother with daughter are bringing a magic pomegranate, kind energy and love to the city, to the human hearts. Bright and joyful painting will add positive mood to your interior. I am holding my little ceramic dolphin in my hand. I love blue color and dolphins. Her color is blue, her vibration is blue, her destination is blue. I am playing with English nouns with the ending -tion. The pomegranate chakras do connect the girl with the Universe vibrations. This is a painting from my new series in which I express my feelings and ideas about the world and write some thought right on the painting. This painting is an illustration to my unfinished fantastic novel which is in process.... "And the night has come. Leia was flying fast into her dream to get a bit closer to the reality." The border between dream and reality is very thin. Where is the true world? Is it in what we live while awake or is it in our night dreams in the world of Wonderland? Where do we go in our dreams? This is painting is a part of my new series of oil on canvas large artworks. It is a research about the world made by woman and female feelings and experiences about the life. Do you remember how to fly? My new series of original oil on canvas artworks where I explore the world and express my feelings about it. The world seen through the feelings of a female. I do write many thoughts, poems and phrases directly on the paintings. I also use black line which is much graphical. Do you remember how to fly? to the magic? to the freedom? Leaving your spirit totally free and going into the blue to the land of magic pomegranates? to the harmony? To love?